Sometimes there is very little that can be added to the bare numbers. Kerry had 74% more possessions & 95% more shots. Their dominance was complete. 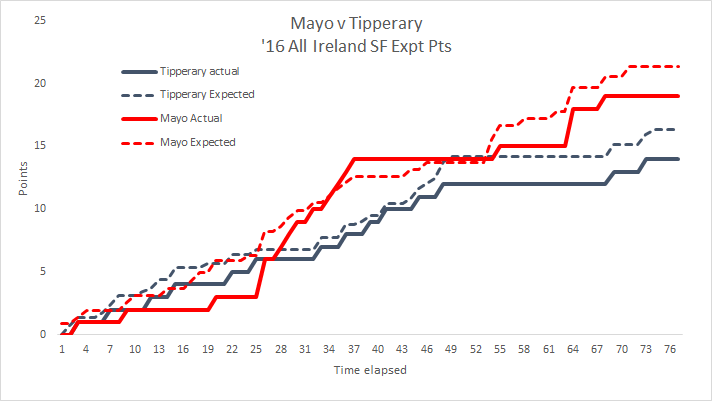 Tipperary’s shooting from play was abject both in terms of quantity & quality. They didn’t shoot from inside the 20m line until the 28th minute whilst it was the 2nd half before they scored from play. Kerry’s shooting was very good. To maintain such a high weighting, and Success Rate, whilst reigning in shots is testament of this. One note of caution however would be the quality of the opposition they faced. 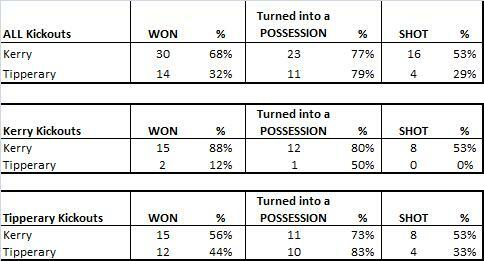 This is factored into the weighting, to an extent, as they were well ahead for the majority of the game (see here for explanation) however they only faced pressure on 1 of the first 7 shots they took in the 1st half – scoring 6 points. Tipperary started slow and maintained that gear throughout the game. Anyone who has read the blog for any length will know that one of Kerry’s major weak points is their deadball accuracy. In a game with no real pressure they had a return of 44% and a weighting of -0.569. Below are the combined ’12 Championship & ’13 League returns for games charted. Compare this to Donegal or Mayo’s returns. Kerry were utterly dominant with a +16 differential in kickouts won a +12 in shots from those kickouts. Kerry generally do not hit their kickouts long. In the 4 league games charted only 18% went beyond the 65m line – that continued in this game with only 13% (2/15) going long. Thanks Tipp! One week after saying we might not see another 80% shot rate this year Tipperay only go and give us 83%. When Galway returned a shot rate of 80% it was due to a soft Roscommon defence. This time however I’m more inclined to attribute the high shot rate to Tipperary’s patience in working what little attacking ball they had into shooting positions. It was their shooting from play, after working hard to get the opening, that let them down. In 2010 Kerry were very good at limiting the opposition to below average possessions – this seems to have continued through to 2012. It will be a blog post for later in the year but understanding how much attacking ball the opposition is going to “let” you have should be a big part of a manager’s equation for when to introduce second half substitutions. Kerry don’t give you as many possessions as other teams – you need to get your subs on earlier if you want to them to affect the scoreboard. That’s 2 teams so far this year that have had a shot rate over 80%. This could be a blip or the emergence of a trend – a deliberate possession based approach worked on over the Winter to counteract the mass defences. Time will tell. 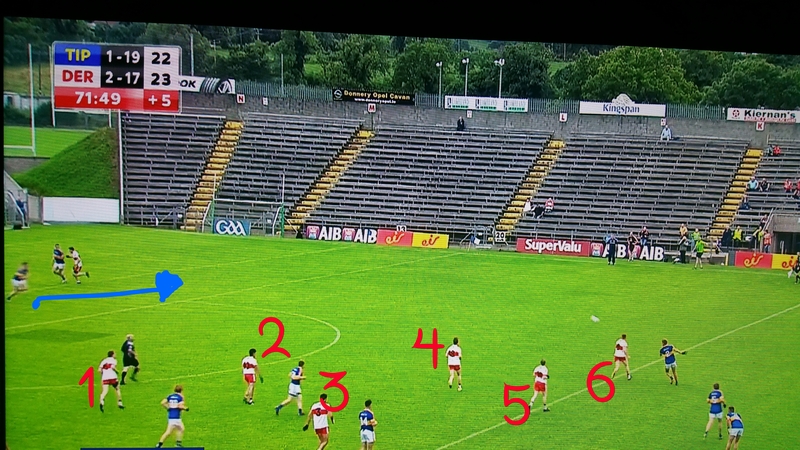 Tipperary worked hard to keep the ball and get into shooting range – and then blew it. 12 of Tipperary’s 17 shots from play were from in front of the posts (sections 5 & 8) however only 4 of these were converted. 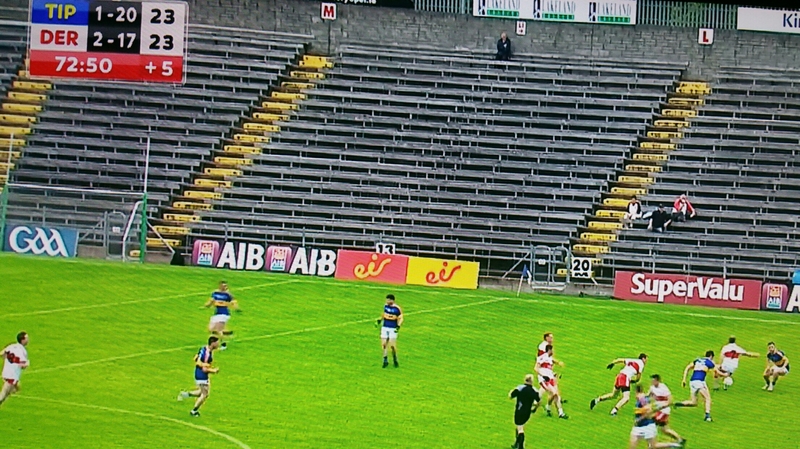 That won’t cut it in any game -let alone one against Kerry. Kerry were Kerry – efficient at converting possession to shots and above average with their shooting accuracy. The one real drawback of note would be their deadball striking. Brian Sheehan is a very good free taker but against Tipperary he was below average. He missed 2 frees inside the 45m and the ones he converted were not sufficiently difficult enough to bring his performance back up. 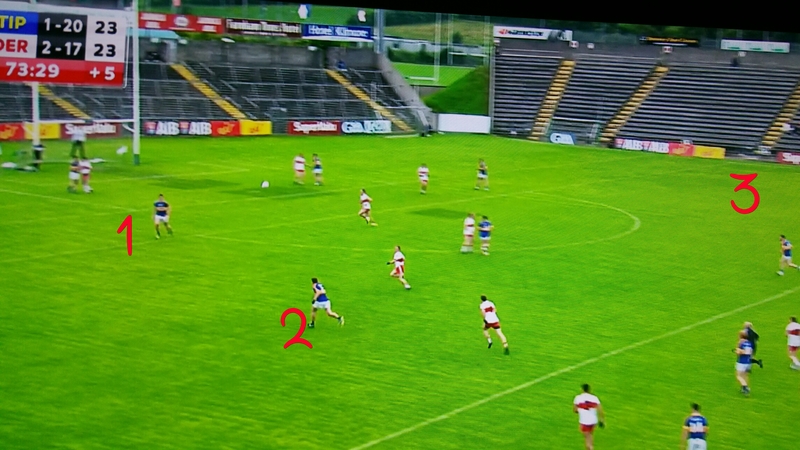 One thing that Kerry are very good at is working the ball into positions that are favourable to their forwards. 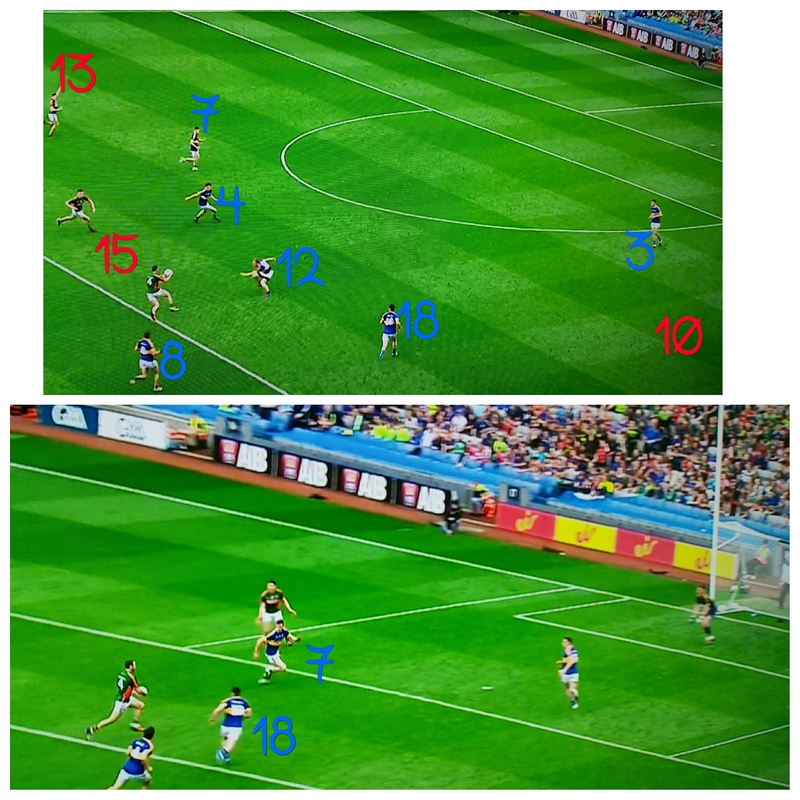 The below shows where they took their shots from and compares it to what Donegal & Galway did. Now this comes with a big caveat in that it is each teams first game of the year but Kerry’s shooting is conspicuously weighted towards the sections directly in front of goal. 63% of their shots came from in front of the goals (section 5 & 8) as oppossed to 44% and 39% for Galway & Donegal respectively. They are taking shots from areas that favour their forwards; ones that consistently have a better success rate. Once we have a few games for each of the main protagonists we’ll have a better view of the individual team’s tactics re where they want to shoot from. Quinlivan had a tough day all round. Kerry’s big guns, whilst not firing, were adequate.